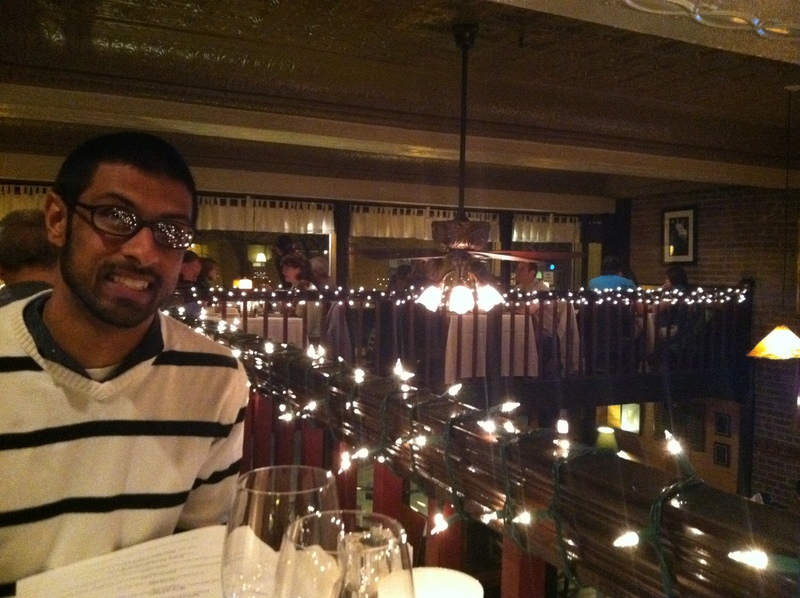 So, my honey took me out to Firestone’s Restaurant Tavern in Frederick instead of Uncle Julio’s in Gaithersburg. What a nice and lovely surprise. 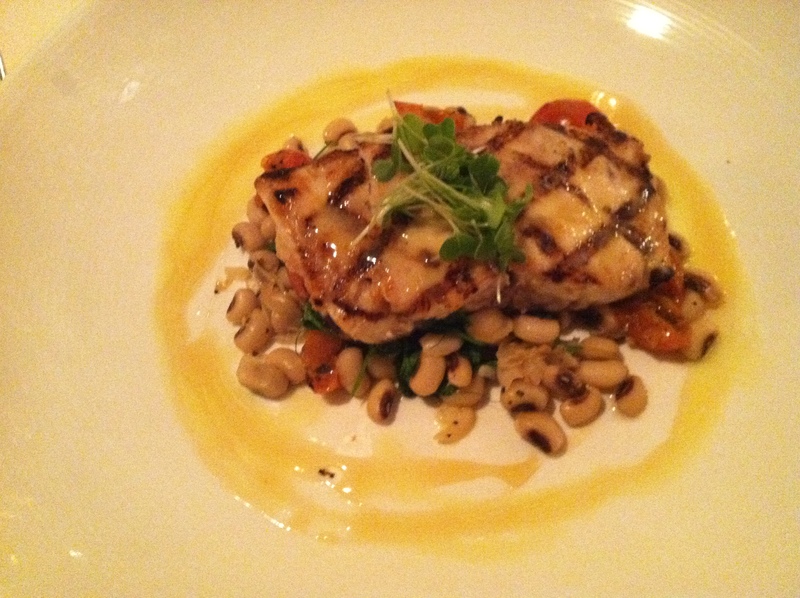 It was especially nice, because it just happens to be Restaurant Week in Frederick! Check out their restaurant week menu. Well, the promotion just ended on the 13th. (Sorry, I’ve been so behind on my posts and so much is going on right now in life– most important, my pending graduation!) But, back to what’s important AT THIS MOMENT– the food. I think he’s smiling because he chose well on the restaurant. Good job. The ambiance was pleasant and though the setting was romantic, at the same time, it was cozy and nothing stuffy about the decor or staff. Everyone was friendly and courteous. The BAR below (as we were seated on the second floor). 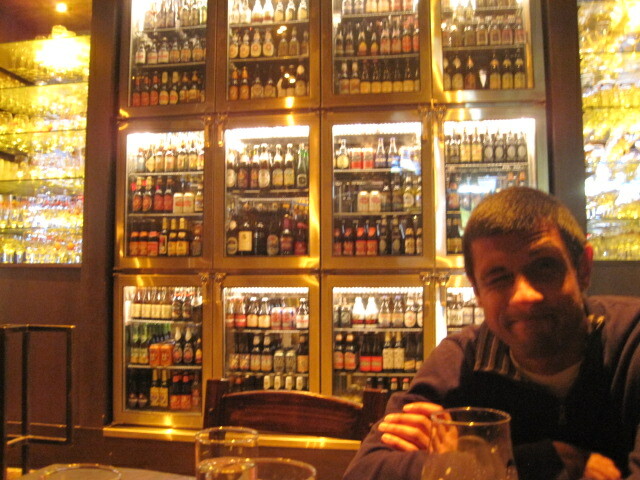 Nice brick building with clean white ceilings and a beautiful painting along with dozens of beers sitting on a mantle. Check out the crowd! Get what I mean by cozy? So, we decided to indulge a little. He got the Malbec (South American red wine) and I got the Pinot Grigio (from Italy, white). I’d say we chose well considering our 2nd courses. First Courses: Prince Edward Island Mussels (Flying Dog hefeweizen–which I love– and fresh orange, topped with Grilled Baguette) and Deviled Eggs (Roasted fennel olive tapenade, caviar, brioche). 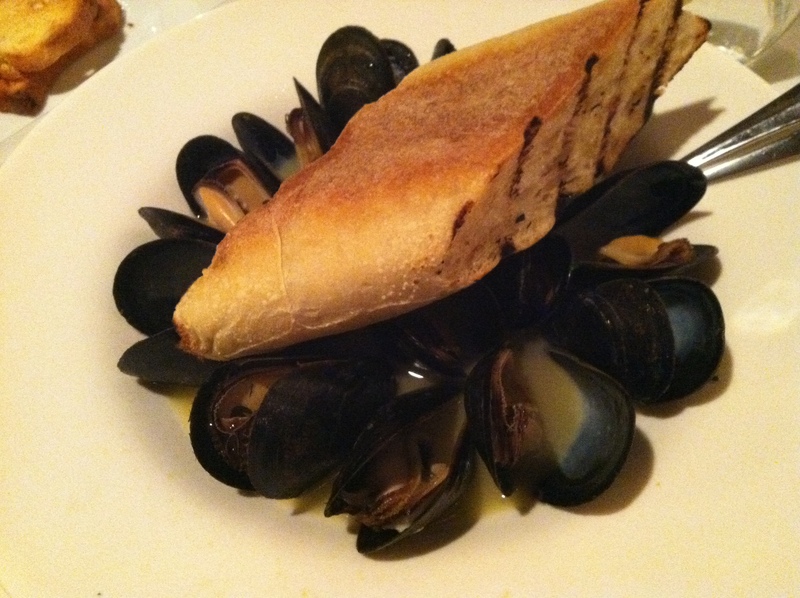 The mussels were good but not as plump as the ones at Mussel Bar in Bethesda, although they are the same type of mussels. The baguette was so buttery and good. I really liked the Deviled Eggs, more because of the garnish like the tapenade and caviar. That’s where the real flavor was. 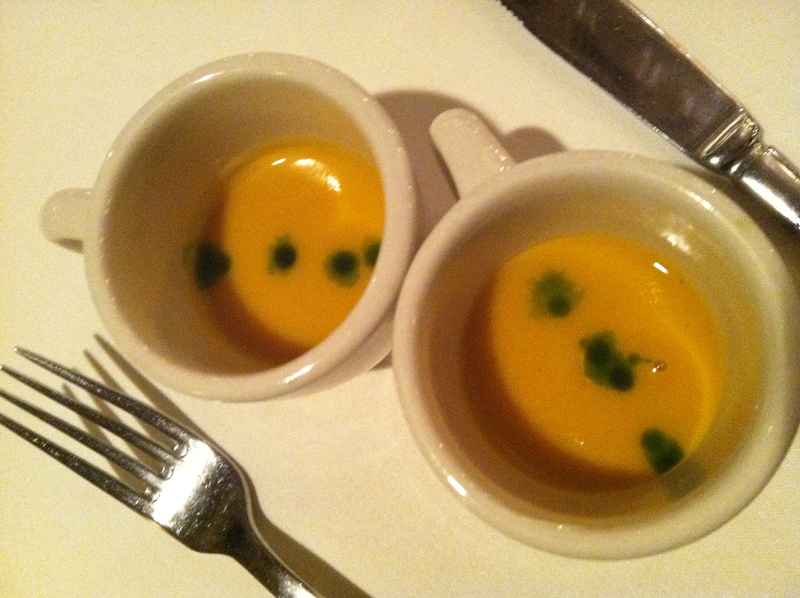 Cleansing Palate 1: Pumpkin Soup– I don’t remember what the green dots were. When these came out, my unsophisticated self did not realize the restaurant was offering cleansing palates similar to the purpose of ginger when eating sushi. Quite delicious, and absolutely just enough to cleanse your palate. I fully enjoyed my Sea Bass. It was so fresh but did not carry that fishy smell that fish sometimes has even after cooking. The black eyed peas, cherry tomato, and pea shoots went so well together with the caramelized honey. It was the right amount of sweetness for the fish, not that I ever imagined sweet flavors mixing with my cooked fish! MM, the shrimp and grits? Very good, although I have to say, it can’t beat Elmo’s Diner down in Durham, North Carolina. 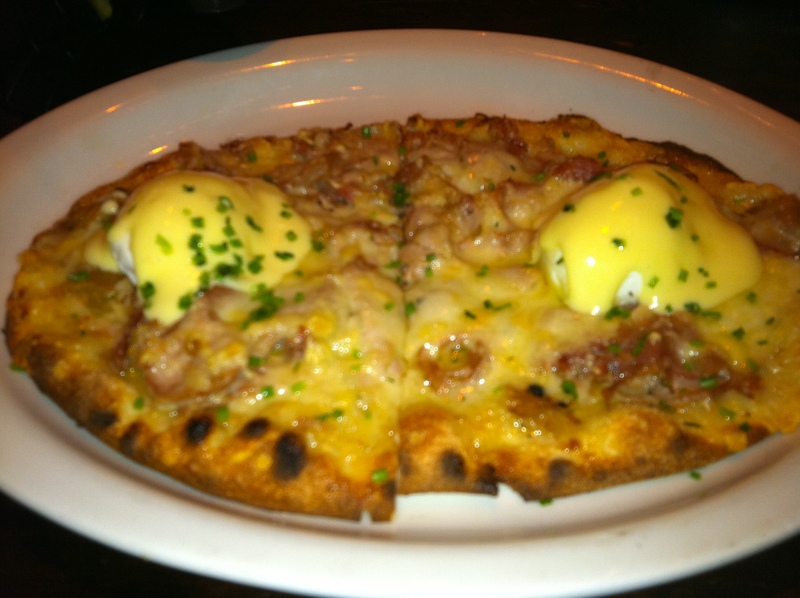 Theirs is a special they have on occasional Sunday brunches… you should be so lucky. Anyway, this was still tasty, but the grits seemed a bit overdone and not like real grits. The shrimp was perfect though! Cleansing Palate 2: Fruit Sorbet Pretty simple– fresh. Third Course: Dessert:: Bread Pudding and Profiteroles. Oh goodness. 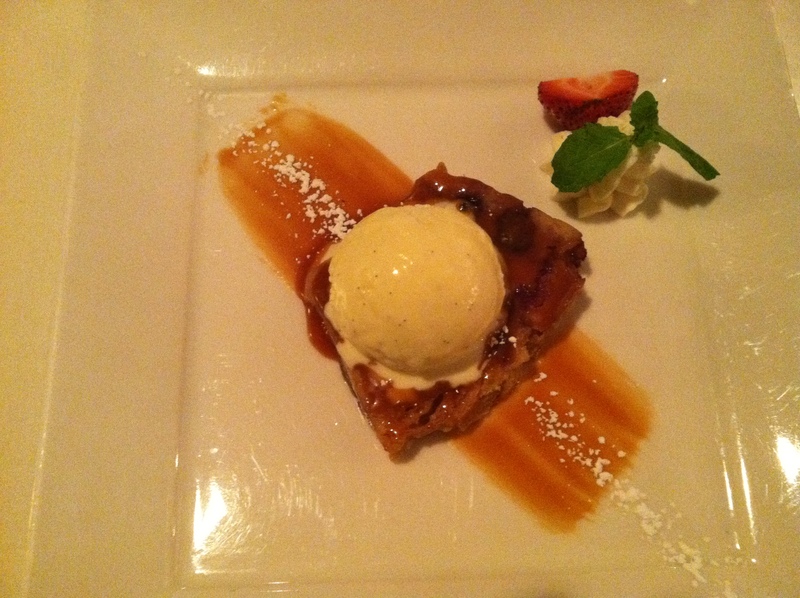 Bread Pudding was great, especially topped off with ice cream and a side of whip. 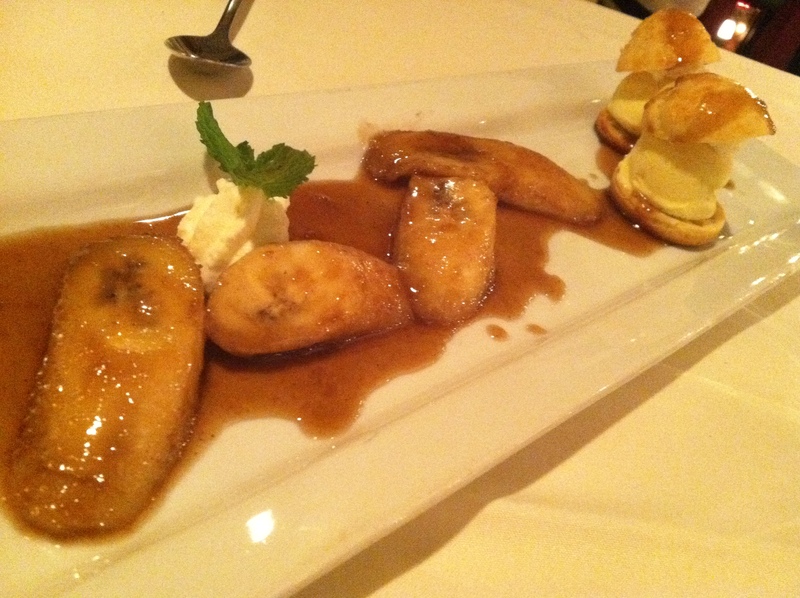 The Profiteroles consisted of fried bananas and sandwiched creams… like mini cream puffs. I think my favorite part were the bananas on that dish. All in all, a cozy romantic dining spot and perfect for restaurant week. Happy night! Grazie mi caro <3. That’s right, I used my last LivingSocial deal for lunch at Mussel Bar. Oh boy, it was good. ONCE AGAIN, I fully enjoyed my meal at Mussel Bar. I loved it so much that I was eating off my friend’s plate of mussels and devouring the unusually large species of capers. 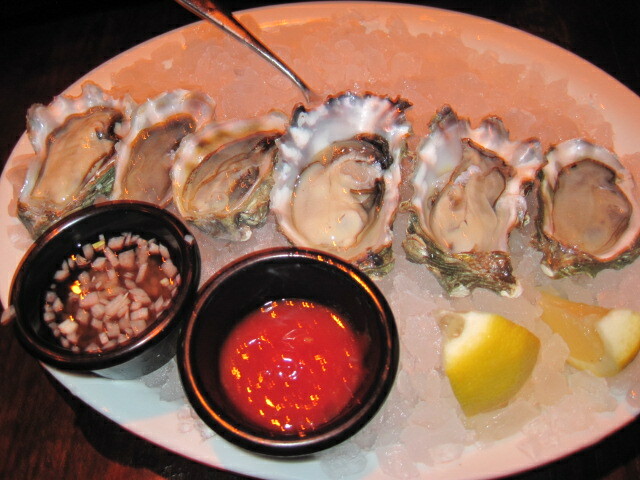 MM, my mouth waters as I think about it…. The last post in a series of 3. Missed the first post? Mussel Bar I– Check it out 🙂 The menu has enough options that we picked out different dishes from the first visit AND second visit. Forgive the photography, I forgot my digi and had to use his iPhone. Heehee. 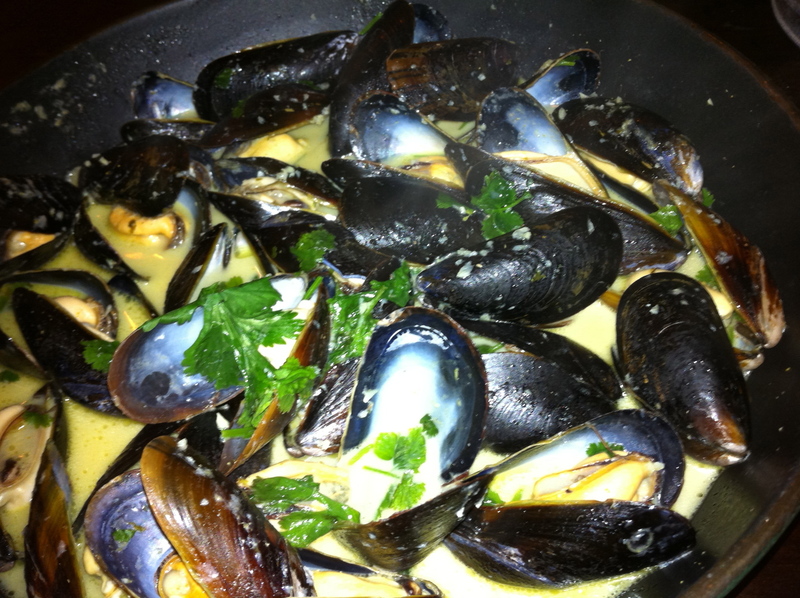 Check out the cilantro on the Spicy Thai mussels. Another creamy mussel dish, but I didn’t mind. It was pretty good, and from what I hear, one of their more popular dishes. About the spice, to be honest, it was not spicy, but it definitely reminded me of Green Curry. I think they use the same ingredients and the cilantro is like the cherry on top. 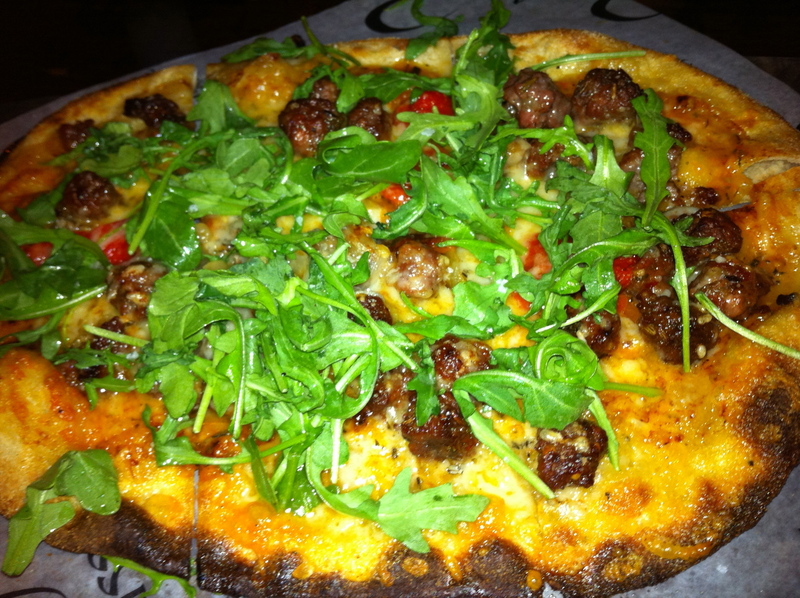 He ordered the Spicy Fennel Sausage Wood Fired Tart aka Belgian Pizza, with caramelized onions and tomatoes. I was really full from my dish, so helping him eat the tart was not going well. Still, I had a few slices, and thought the sausage was too sweet for my taste. I think it was the fennel? It was good, but I would prefer more spiciness or saltiness than the sweet on my sausages. I changed the regular side frites for my mussels to the Vanilla Sweet Potato Frites. These fries were like dessert. It’s funnel cake in frites form! I don’t think this would appeal to many people, but I really loved it. 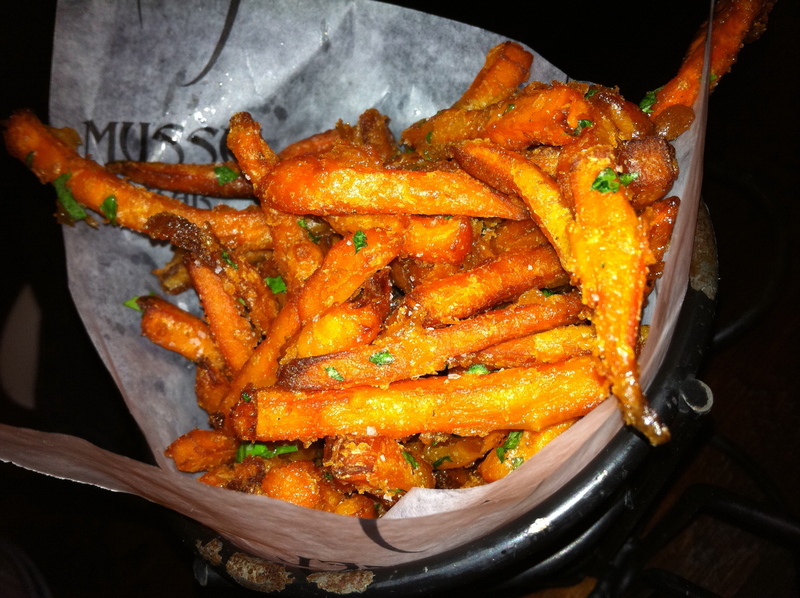 These are probably the 2nd best sweet potato fries I’ve ever tried in life. Then there was dessert. 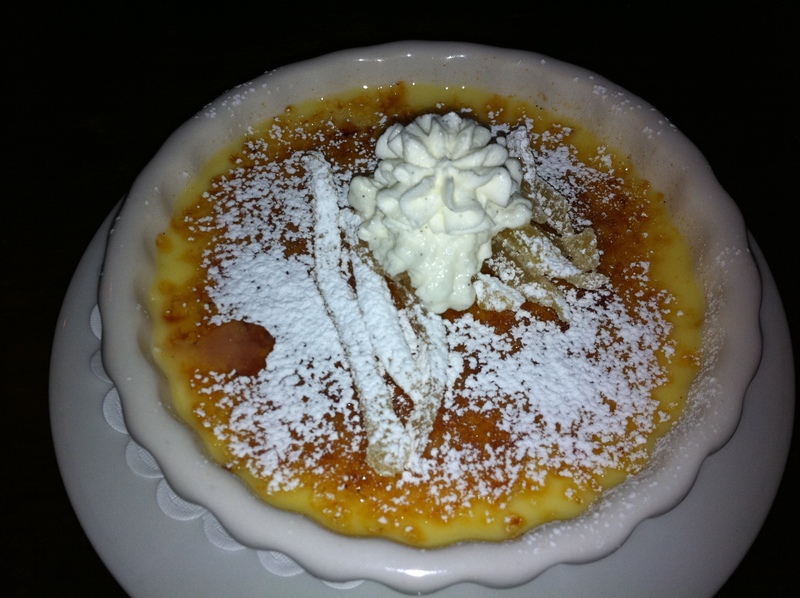 This is the Vanilla Bean Creme Brulee with crystallized ginger. The creme brulee itself was very good, creamy, but light. I didn’t really like the strips of crystallized ginger on top. It was too chewy and bitter. Along with dessert, the manager brought out two shot glass sized tastings of their Belgian Raspberry infused beer for us. IT WAS SO GOOD! Oh my, it was like fizzy raspberry, but not like soda. If you’re not a huge fan of beer, this is a great alternative! I’m not sure why the manager treated us with the tastings, because it seemed like he singled us out. Of course he did the usual rounds of making sure everyone’s dining experience is good, but I think we were the only ones he offered the tastings to and chatted with us a bit. Maybe it’s because he noticed we were taking pictures, or maybe because he recognized us from the other 2x we had been there! I don’t know, but the food is outstanding and the service is friendly and attentive, but not in the overbearing way. 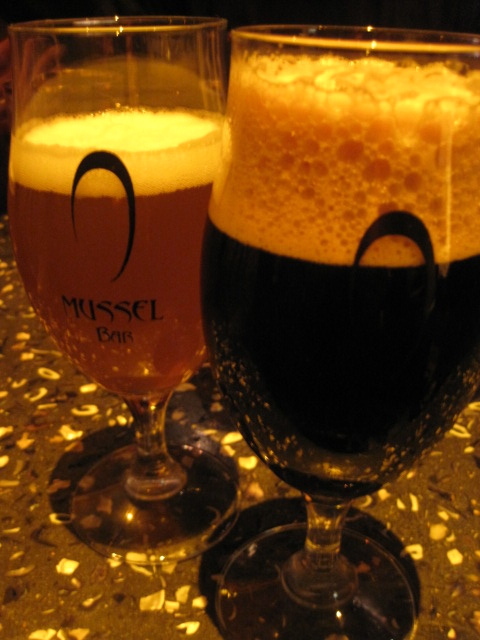 I really like Mussel Bar and I look forward to my next visit there… for lunch! (My last living social coupon :P). This will the first of 3 dinner reviews. That’s right… in a span of 2 weeks, I dined here for dinner 3x. Thank you LivingSocial. 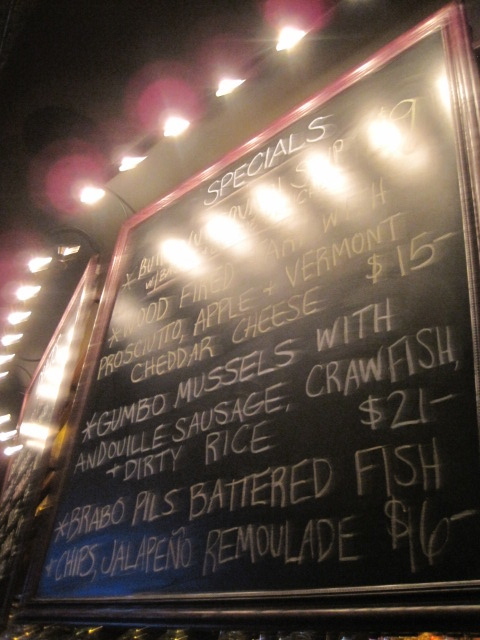 The specials of the evening! We arrived on a busy Saturday night. If I recall correctly, we waited a little over an hour for a table for 2. Just enough time for 2 beers each! Mostly Belgian style of course, as that is their specialty to pair off with the mussels. I first heard of this place through a friend’s blog– Lunching in the DMV. 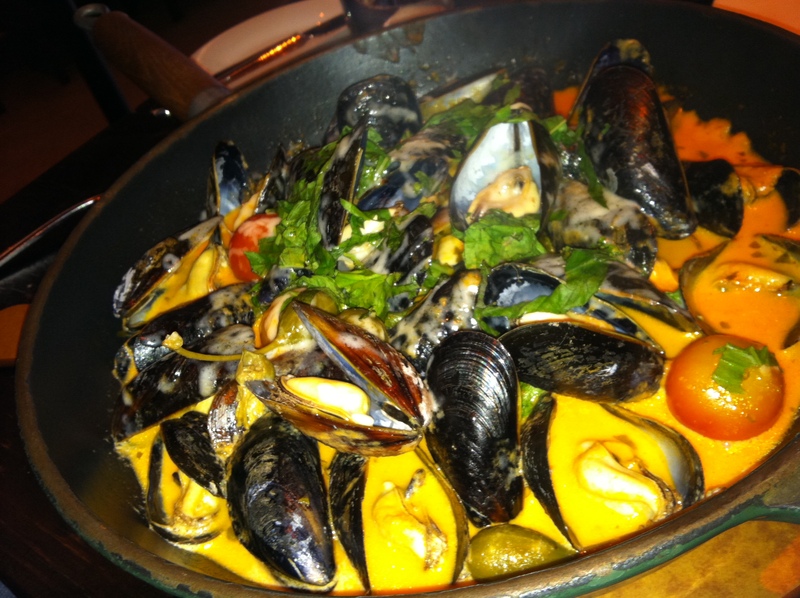 She reviewed two types of mussel dishes, the Shroom and Spicy Thai, both good but heavy because of the cream. Well, after reading her review, I was definitely putting Mussel Bar on my list of restaurants to try. 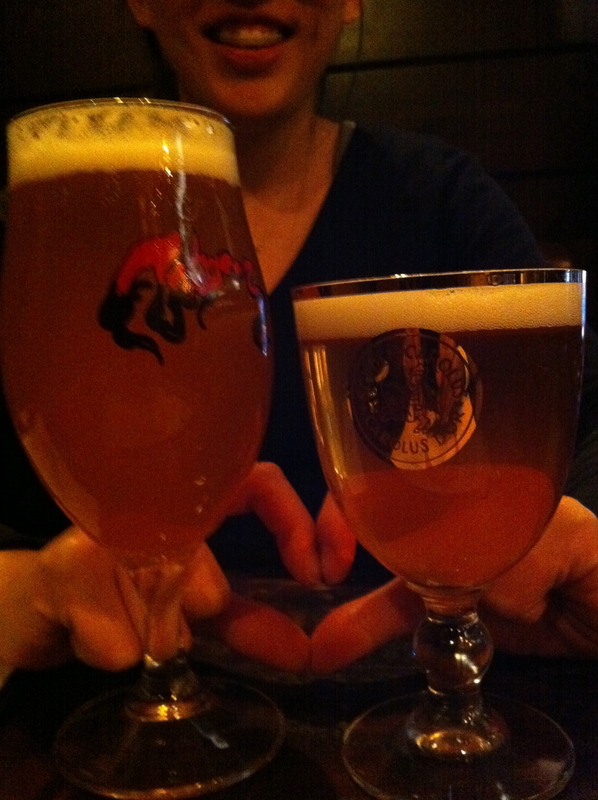 Check out their beer! 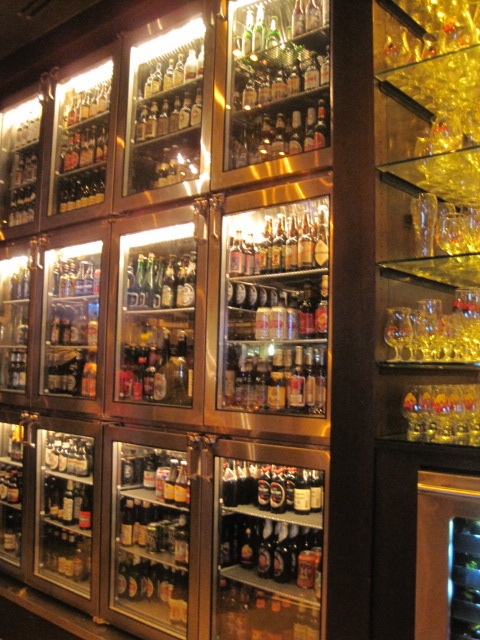 This was only half the case… Belgian Beer heaven? They offer up west coast and east coast oysters on a bed of ice, 2 wedges of lemon, cocktail sauce, and I can’t tell if it’s onion or cucumber vinegar. We asked what the difference between west and east was and she said they’re both similar in size at the moment, but west coast is a bit sweeter. So, we went with WEST. MM, slurpy goodness. I enjoyed them for being on the east coast. I mean, they can’t be as perfect as when you’re in San Francisco and they caught it like 5 minutes before serving it up. So, for being on the opposite coast, they were decent. 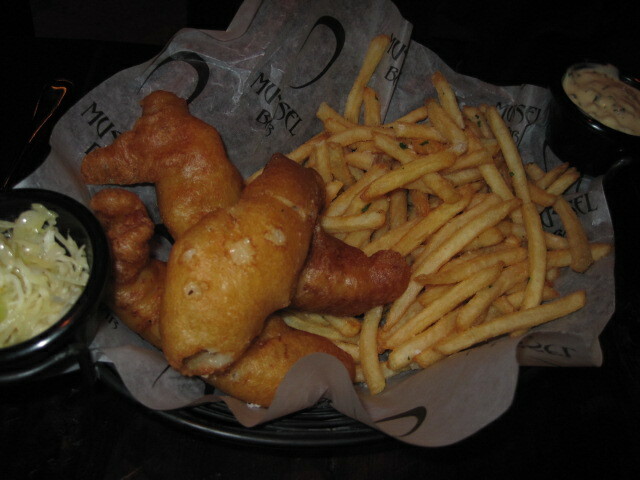 He went for the Brabo Pils Battered Fish and Chips with Jalapeno Remoulade at $16. One of the specials of the evening! The fish and batter were AMAZING. I have to say this because it is rare to find a nicely battered fish. Yes, battered fish is greasy, but believe it or not, this was like light grease, and fluffy batter. The fish was fresh and tasty, not salty. 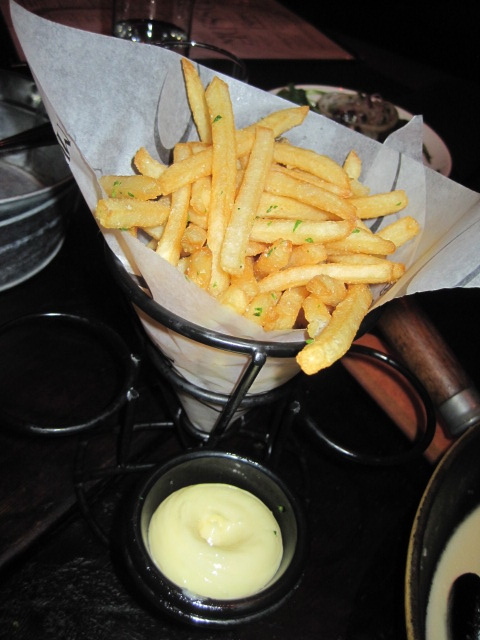 And the frites? Good. Is this too bright? 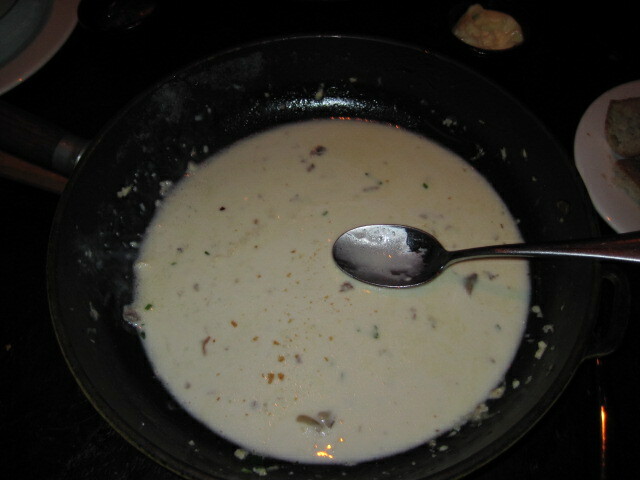 I just wanted everything to come out in the picture, like the fresh herbs, succulent mussels in a creamy sauce, chopped bacon, and chunks of mushrooms. Oh yes, this was definitely creamy, but oh-so-delicious. Their mussel dishes are Blue Bay Prince Edward Island Mussels (hehe, reminds me of Anne of Green Gables 🙂 I ordered the Wild Shroom (Pancetta, Parmesan, Truffle Cream) mussels. All mussels dishes come with frites. Say it right. Apparently their mussel dishes are $16 according to the menu on their website, but I swear these are $17 on the menu in the restaurants. Perhaps they should update the website, si? I needed something green! 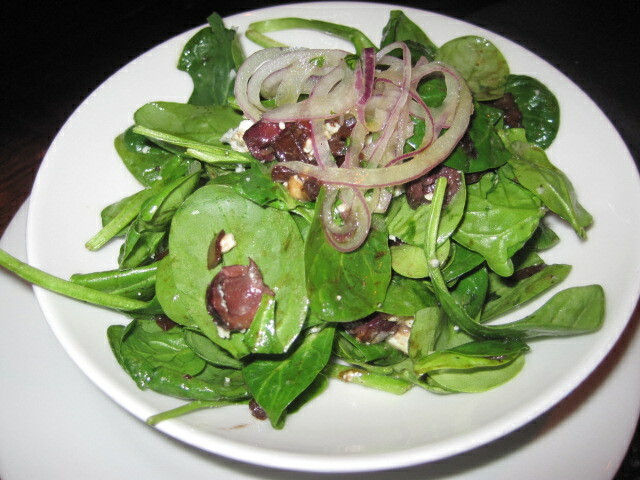 We ordered a half size (at request) of the Baby Spinach, Caramelized Balsamic Shallots, Maytag cheese, Nicoises Olives, Marinated Red Onions Salad. This was a nice, and though it did not sound it– simple, salad. I love how they do not drench it in dressing like some restaurants. Whenever I go to a chain, I have to remember to order the dressing on the side. Not here though! Was I satisfied? Did I eat well? Was it good? See for yourself. He’s lookin’ happy. 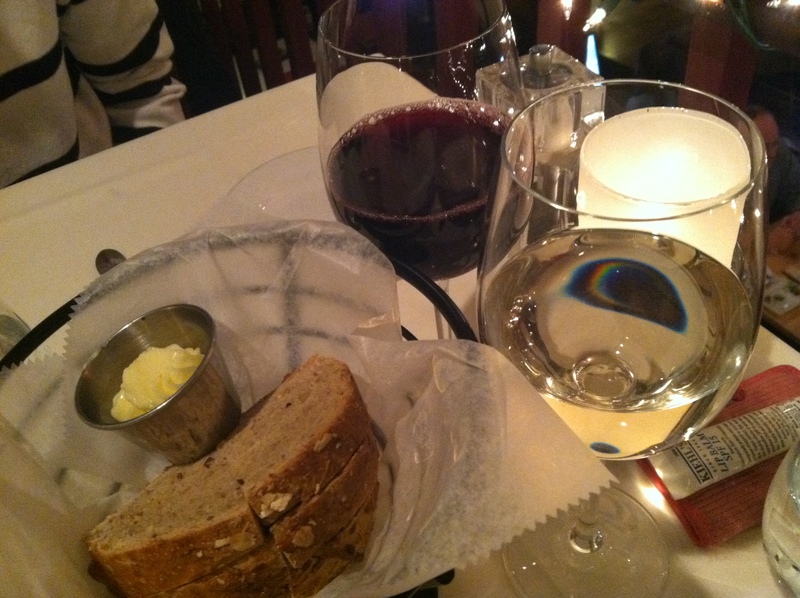 Cheers to a good and scrumptious dining experience! I actually don’t remember if I’ve ever had pizza in NYC. It’s not usually on my top 10 list of things to eat when I visit. Shocked? 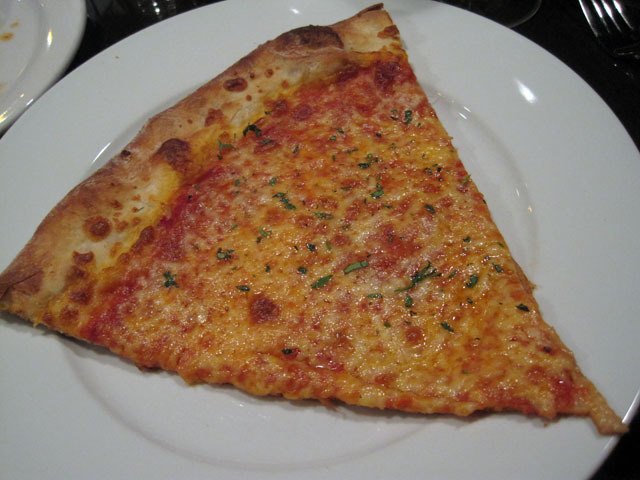 So am I a little… because I always hear how great NY pizza is and that’s how real pizza should taste like. Don’t get me started on what real pizza is… all I have to say is “ITALY”. Anyway, before hitting up the awesome play Beauty of the Father at the cozy theater, GALA in Columbia Heights, I met up with friends at Radius Restaurant. It’s a cozy hole-in-the-wall place on the second floor of a small building. They already ordered a plate of really good mussels and the $5 happy hour deal of a plain cheese pizza and beer. I opted for the Rodenbach ($7), Belgian beer, and cheese pizza. 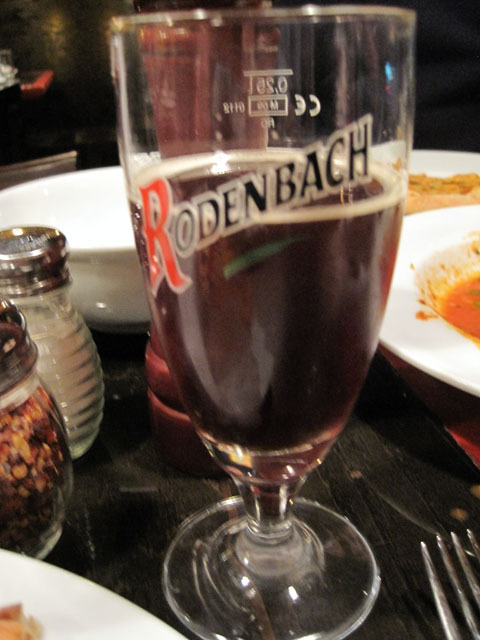 The Rodenbach was a dark beer but wasn’t heavy at all. It was actually kind of light and really tasty. Sorry, I’m not a beer connoisseur and my adjectives are limited. The pizza was REALLY good. It was thin crust, not too much sauce, not too much cheese, and the right amount of herbs. 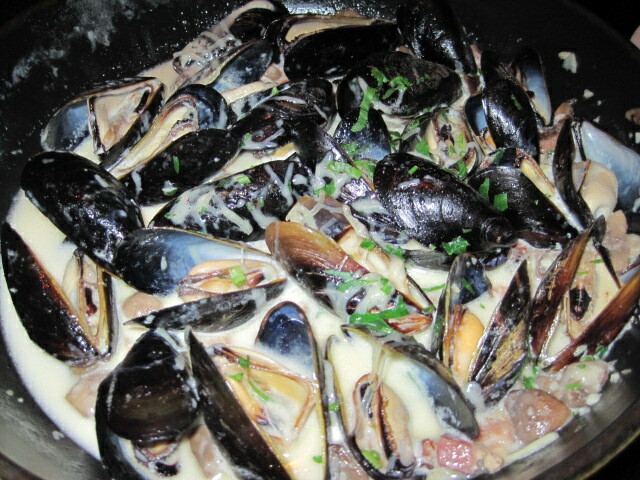 And, obviously from the picture below, the mussels were pretty good as well. Just couldn’t catch the picture in time! It was that good…. *Note: The waitress we had was not the best. She forgot our bread, twice. She didn’t bring me water when I arrived late. She didn’t refill. She wasn’t very nice or responsive. Yeaaah, things like that kind of matter. It’s part of the restaurant experience, but for this place, the food stood out…. so I would go back. Good bread. This is important to note as not all restaurants give out the yummiest breads. Some sort of squash soup, I think maybe Kabocha. I got the salmon and salad/toast. I didn’t taste the soup but it came with a crabstick roll and looked good. My dish was tasty. The salmon had some sort of sauce drizzled on it and the salad was just right. I didn’t really touch the toast. Too hard and didn’t do much for the dish in my opinion. Mussels in a pot with fries. Can’t go too wrong with this entrée. I did enjoy the mussels and the fries here were better than Bistro du Coin (Conn. Ave). 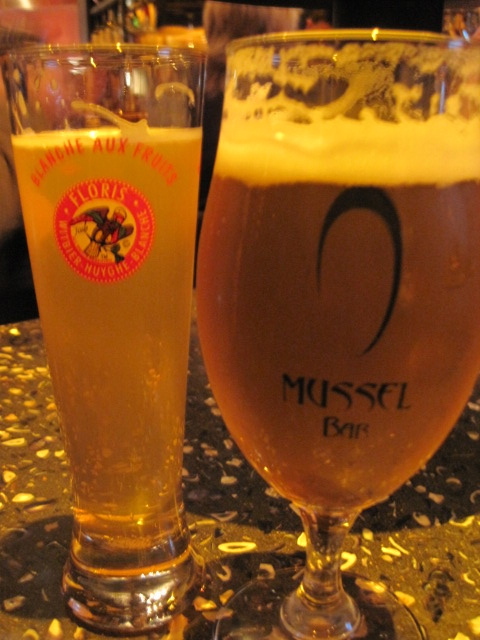 Still, I think the mussels were a little better at Bistro du Coin. 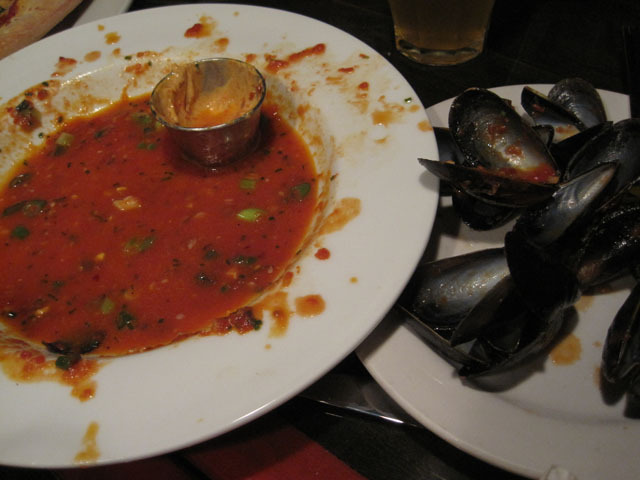 Perhaps it was because Belga Cafe was busy at their lunch hour and so their mussels were not to their usual standard. Still, that is not an excuse. A restaurant should ALWAYS live up to its reputation if not more. I did enjoy the mussels, and again, the fries were good. The waffles were accompanied by raspberries and I think a raspberry sauce and vanilla ice cream. Loved this whole plate. We were definitely full by the time dessert came out but it did not stop us from enjoying every bite. Overall: Lunch is a good deal during Restaurant Week in D.C. It was $20.10 this year before tax and gratuity. 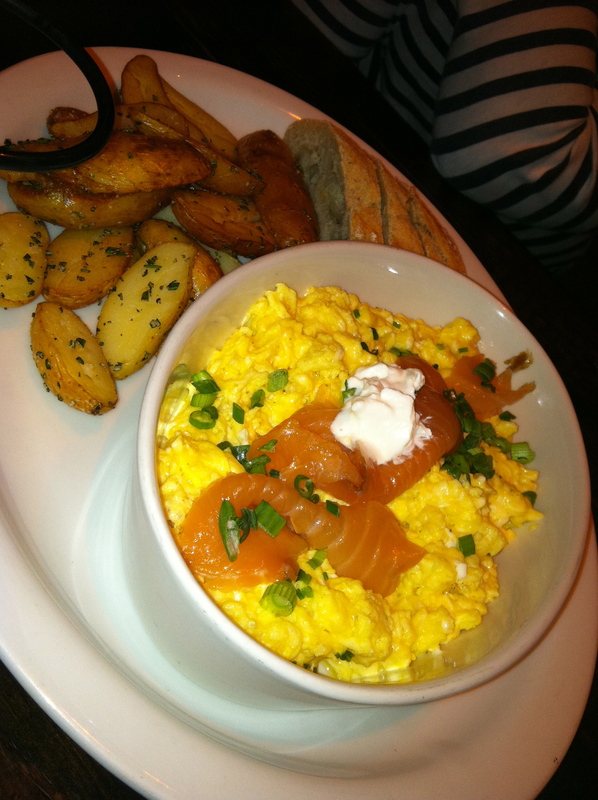 I enjoyed the intimate and friendly atmosphere of the restaurant. Though it was difficult to order a beer (I was confused about who our waiter was), I would go back on a date because it was good food in a good space. I would say 3.5 out of 5 stars for ambiance, staff, and food.